1. Starting with the bottom hole of the end spacer, thread the sinew through it and knot with an overhand knot. 3. 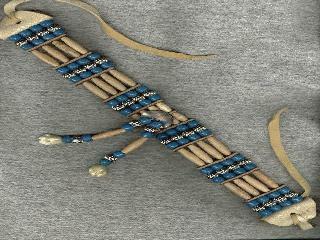 Now thread the sinew up into the next hole of the 5 hole spacer and repeat the nuggets, seed beads and hairpipe pattern. Repeat steps # 2 through #3 until you reach the end spacers last hole on the top row. Tie an overhand knot to the sinew once you thread the sinew through that last top hole of the end spacer. Now put this aside for a minute. Take the abalone disk and thread the sinew through one of the holes. Using the middle 2 inch hairpipe, thread the sinew around the hairpipe, center the disk, bring the sinew around and thread it through the other hole in the disk. 1. Take the fish hooks and attach them on the hole at the top of the abalone disks. 2. Now follow the same instructions above as if you were attaching the disk into the choker except you will not be threading the sinew around a hairpipe. You can use other stone nuggets to do this necklace and earrings also like Coral, Tiger eye, Malachite, Amethyst, Lapis or Hematite.